Afghan security forces remain unprepared to defend Afghanistan despite U.S. expenditures of more than $54 billion on training and equipment, the Obama administration’s top oversight official in Afghanistan warned on Wednesday afternoon. There are "multiple problems" for the United States to surmount before the Afghan National Security Forces (ANSF) are ready to assume control of the country after American forces depart in 2015, John Sopko, the Special Inspector General for Afghanistan Reconstruction (SIGAR), said during a speech at the New America Foundation. "The impending end of the U.S combat mission has led some to erroneously believe our involvement in Afghanistan is waning," Sopko said. "I believe the United States and its allies are entering the most critical phase of the reconstruction effort in Afghanistan," which is one of the most corrupt nations in the world. Sopko said he remains "very concerned" over the ANSF’s failure to recruit and retain troops, many of whom join the force and then desert it. "We are very concerned because the ANSF were supposed to achieve an end strength of 352 thousand troops by last October," Sopko said, according to his prepared remarks. "The ANSF has fallen short of its staffing goals by 20 thousand troops," he said. "The number of troops ready for duty is even lower when you consider AWOL employees, desertions, and ghost employees." If the United States fails to prepare the ANSF by the time they leave in 2015 Afghanistan will likely revert back to terrorism, Sopko warned. 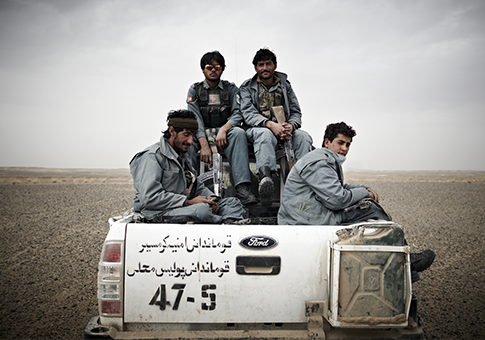 "Without adequate security, meaningful progress in Afghanistan is not possible," Sopko said. "We need to ensure security or else everything we are trying to do will fall apart." "Afghanistan could also once again become a safe haven for al Qaeda and others that are determined to harm our nation" without a well-armed and well-trained security force, Sopko said. Sopko went on to accuse the Pentagon of exposing itself to "waste, fraud, and abuse" by failing to tell SIGAR about the ANSF’s exact personnel numbers. SIGAR remains concerned "about the accuracy of the numbers coming out of the Pentagon," Sopko said. "The [Department of Defense] told SIGAR there is no way to validate the ANSF’s personnel numbers, often derived from reports prepared by hand by Afghan troops." If the United States fails to determine what exactly it is paying for, "we expose ourselves to potential waste, fraud, and abuse." Sopko said there has already been much fraud in post-war Afghanistan, outlining multiple examples of theft and taxpayer-funded reconstruction projects gone wrong. Unidentified Afghans recently stole around $50 million for the U.S. government and stashed it in an Afghan bank account. After serving the Afghan government with a court order to freeze the account, "we were told the bank account was frozen and the money protected," Sopko said. "A few weeks ago we learned that the money was mysteriously unfrozen by some powerful bureaucrat in Kabul," he said. "Now, most of it is gone." Many taxpayer-funded reconstruction projects have also failed, Sopko said. "SIGAR has found police buildings turned over to the Afghans that sit empty; a lack of trained personnel capable of conducting basic operation and maintenance on the nearly 900 facilities the United States is building for the security forces," he said. Additionally, the Afghan Ministry of Defense "may not even be able to handle purchasing fuel for the Afghan National Army once U.S. troops leave," Sopko said, explaining that the U.S. government has failed to "account for the fuel it provided to the Afghan National Army." The problems are only compounded by Afghanistan’s dire economic situation and rampant corruption. As an "exceptionally poor" nation the Afghan government could find it difficult to continue funding security and reconstruction efforts once the United States pulls back funding, Sopko said. "The International Monetary Fund recently released a report about the looming budget crisis in Afghanistan explaining that it is partly caused by widespread tax evasion and the increasing theft of customs revenues," Sopko said. "They noted that the Afghan government can’t even cover half of the country’s current budget and is years away from being able to pay its own expenses." Afghanistan raises about $2 billion in annual revenue. Yet it will require upwards of $10 billion per year in order to sustain the country, Sopko said. Some of Afghanistan’s customs bureaus are so deeply corrupt that more than 70 percent of potential government revenue is lost or stolen, Sopko said. "Unless the Afghan government raises more revenue, the U.S. mission will be at risk," he said. "Until I see otherwise, I will remain deeply concerned that we need to see more progress from the Afghan government on corruption connected to taxes and customs." Even more worrisome to Sopko is the upcoming Afghan election scheduled for 2014 and another parliamentary election scheduled for 2015. "If either of these elections goes badly, the impacts could damage the Afghan government’s legitimacy, incite ethnic and tribal tensions, and inflict a devastating blow on the chances for a political settlement to the afghan conflict," Sopko warned. Ballot stuffing and corrupt election laws remain a chief concern ahead of the election, according to Sopko, who said that Afghan officials do not even have the ability to identify counterfeit identity cards. "Unless we fix problems like these before the 2014 presidential election, the Afghan people may have powerful reasons to question the results," he said. Sopko said he would threaten to push for an end to U.S. aid to Afghanistan if the government fails to adequately combat corruption. This entry was posted in National Security and tagged Afghanistan, John Sopko, Middle East, Obama Administration, SIGAR. Bookmark the permalink.